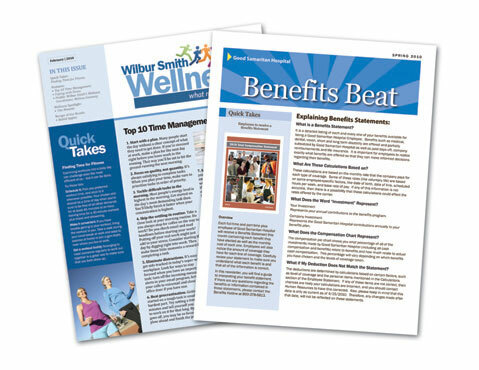 By offering employees many different mediums in which to service their employee benefit questions and needs, you begin to engage your employees in helping them understand the true value of their benefit package. The first part of the READ.CLICK.CALL. program is the READ. Below are services which fall into this category. Our in-house graphic design team will custom create 12 to 24 page benefit booklets to your company look and feel. Since inception, the feedback from clients and their employees for these booklets has been nothing short of astounding. Contains all relevant information pertaining to their employee benefit plan. Carrier telephone numbers, policy numbers and other contact information all in one place, employees will know exactly who to call when they need assistance. Too often companies spend little to no time helping employees understand the value of their employee benefit plan in terms of actual dollars. Our in-house graphic design team will custom create 12 page statements for each of your employees to help them begin to realize the total value of their compensation at your company. Build upon your overall communication strategy to employees by using high quality communication posters throughout your company. From time to time, you might find the need to communicate with employees through a newsletter. Leverage our staff graphic designers to assist in making a great impression upon your employees.